The Edwardian style can look great and it doesn’t matter whether you prefer Hardwood Conservatories or uPVC Edwardian Conservatories – both will look stunning. With simpler floor plans, this style can offer a feeling of space and are commonly seen in more regular, rectangular designs and is often said that the Edwardian conservatory style is more practical than Victorian. Solid in-fill panels can be an alternative to full glass side and when in-fill panels are fitted to the lower sections, especially with new colours and wood effect uPVC available, this can help create your own individual look. Safety glass which meets British Standards should also always be fitted – on conservatories with full glass sides, the lower areas of the sealed units will be at risk of accidental damage simply from day to day usage. This safety measure is even more important where children use the room. 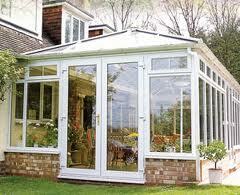 Structural strength in the conservatory comes from metal reinforcing built into the frames, but if you are looking at a large room, then additional strengthening could be required. The excellent thermal properties of new double (or triple) glazed sealed glass units help to reduce the feeling of being in a “greenhouse” during bright sunny weather, and as a result, full height glass sides on Edwardian conservatories are being seen more often. Outward opening French doors are a nice feature when used as the entrance, whereas patterned or “leaded” glass can be used in the small fanlight windows to add colorful and classy looks. Roof vents are a popular addition. Electric and manual functions are readily available. As with all conservatory rooms doors and windows, safety and security are important considerations, the inclusion of multi-point locks, designed to resist, picking, drilling and bumping should always be seriously considered. 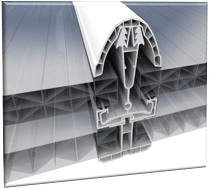 Fitting Poly-carbonate can potentially save you money on the overall cost because it could reduce the structural strengthening needed, especially for larger roof sections. For use in lowering glare and “solar heat gain”, tinted panels, such as Bronze or Opal are available. 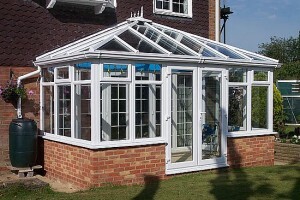 It’s always prudent to check with your local authority about possible planning permission requirements for your proposed conservatory, as there are some rules regarding the size and location of any home improvement like this – most installers will be able to give professional help in this area. Please feel free to review our Planning Information section to get basic guidance on the most common areas of concern. Compare fully fitted cost quotations.